The Starz animated films Hellboy: Sword of Storms (2006) and Hellboy: Blood and Iron (2007) are releasing to a double feature 4k Blu-ray Disc on Tuesday, April 2. The new disc edition, already available on Blu-ray, anticipates the premiere of Hellboy (2019) in theaters on April 12, 2019. 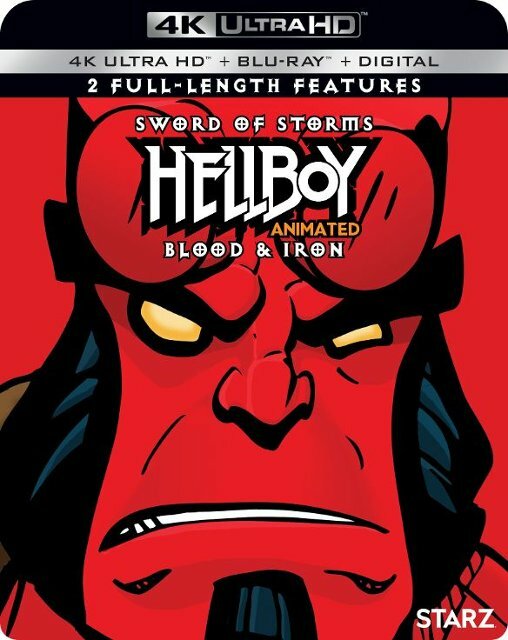 The Hellboy Animated Double Feature includes the two full-length features “Sword of Storms” and “Blood & Iron” in the exact packaging as the Blu-ray edition except for the black “4k Ultra HD” strip at the top. The Hellboy Animated Double Feature is available to order for only $15.00 from Amazon or $15.99 from Best Buy. In addition, Hellboy II: The Golden Army on UHD BD is available to order from Amazon for $21.64 (List: $29.99). The title releases to Ultra HD Blu-ray with HDR and DTS:X immersive audio on May 7, 2019. The Hellboy films may also launch in 4k on digital platforms such as iTunes, Prime Video and Vudu, but likely after the 4k Blu-ray Disc releases. Apple should automatically upgrade your HD version if already purchased, but other services may require the UHD to be bought separately. The first Hellboy movie from 2004 was originally listed as a 4k Blu-ray release on Amazon and Best Buy but has since been removed. We’ll keep you updated when we hear more about this must-own Hellboy title which is by and large the best of the films so far. Hellboy was created by famed writer/artist Mike Mignola for Dark Horse Comics. The character has appeared in numerous comic book titles such as B.P.R.D., Abe Sapien, Witchfinder and Dark Horse Presents publications. Next Next post: New Releases This Week: Bumblebee, The Mule, Vice & more!